Hi all! 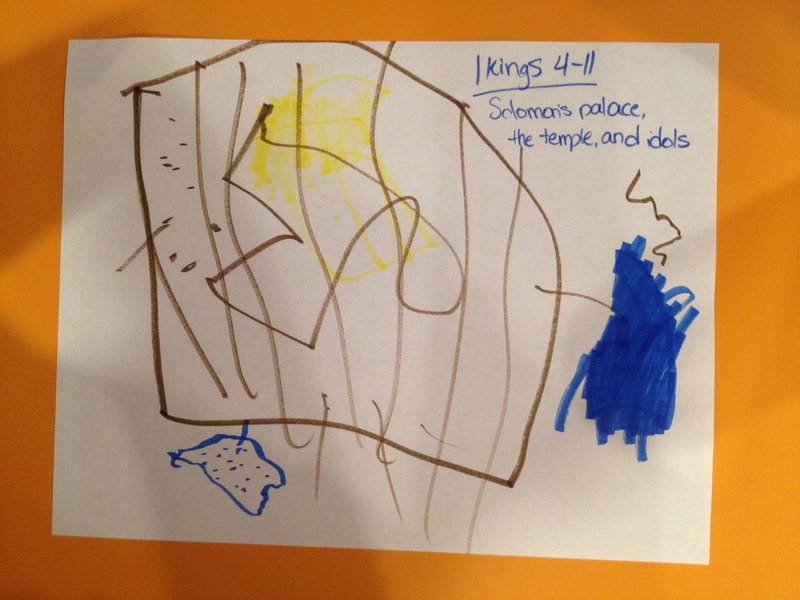 For lack of a better title, today we’ll be learning about King Solomon, part 2. This is taken from 1 Kings 4-11. King Solomon as you remember asked God for one thing: wisdom. So he could understand things and make good choices and be a good leader for Israel (God’s people). God was happy with Solomon’s choice and He gave him great wisdom. The people were so impressed with all the things Solomon knew that many many people came to visit him and they brought lots of money and presents to Solomon. Solomon asked God to listen to the people if they made a mistake. He asked God to forgive them and bless them. God said He would. Now when we pray, the Bible says Jesus sits with God and He talks to God and asks God to forgive us and bless us. Jesus is our helper and friend. God told Solomon that as long as he obeyed God, that Israel would do well and that someone from Solomon’s family would always be king. But Solomon, like all people, made mistakes sometimes. Solomon had a lot of wives. And a lot of his wives worshipped other “gods” like statues or pictures of other pretend gods. Solomon let them worship these pretend gods and he even built some statues and some small places for them to worship. God was not happy. God is the only REAL God and Solomon and the other people should ONLY worship Him. God told Solomon because he had disobeyed that Israel was in trouble. A small part of the country and some of the people would be ok, but most of it was going to be taken away. 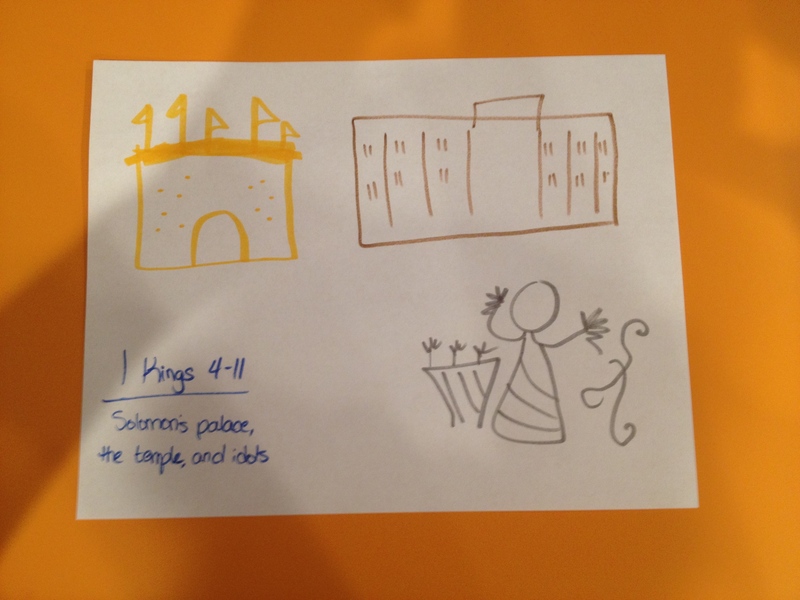 When Solomon died, his son Rehoboam became king and we will learn more about what happens next tomorrow. Solomon did some great things. He built a very fancy and strong house for God. He was very wise and gave Israel a lot of money and built a big palace. But he also made some bad choices and disobeyed God. And there were some bad consequences because he disobeyed. 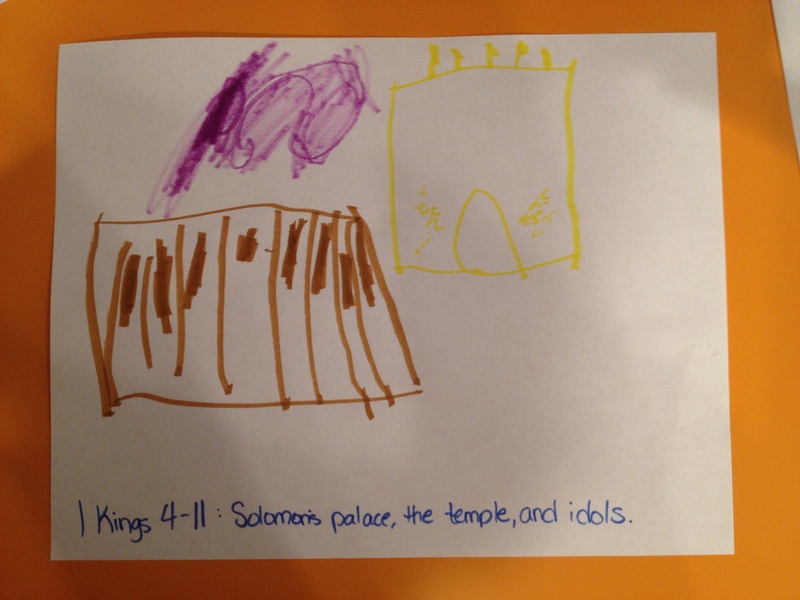 For our craft today, we drew the palace, the temple and the idols to help us remember Solomon’s story.